How Often Should You Change Your Air Filter in Your Company Space? Home » News » How Often Should You Change Your Air Filter in Your Company Space? You want your commercial space to be a safe place for both your employees and your customers. You’ve made sure to identify any hazards, you have strict regulations in place when it comes to keeping potentially dangerous chemicals out of reach, and your team knows all about your safety policies. However, the truth is that you might still be forgetting something: changing your commercial air filters. So, how often should you change your air filter when you have them in place in your commercial spaces? As you’ve likely guessed, the answer can vary depending on the type of space you’re working with, as well as other factors within your workplace environment. Keep on reading to learn more about how often to change the air filter in your building, shop, or even restaurant. Of course, how frequently you’ll need to change your commercial air filters depends on lots of different factors. You’ll need to think about how many people are in your commercial space, any chemicals or allergens that are frequently interacted with, and even the kinds of things you create within it. Let’s take a look at common commercial spaces and how often to replace air filter now. How often should you change your air filter if you’re working in a standard office? In most cases, changing out the filters about three to four times a year should be sufficient. You may need to do this more often if you have a larger number of employees, or if people working for you have weakened immune systems or allergies. Even if you’re just in a common office environment, contaminants like odors, dust, pollen, hair and even fibers from clothing can still compromise your air quality. In fact, even dead skin particles can contribute to poor air quality in the office! If you notice that members of your team seem to be sniffling much more frequently lately, or have realized that your office heating and cooling bills have skyrocketed, it’s likely a sign that your office’s air filter is in need of attention. It likely won’t come as much of a surprise to you that you’ll need to conduct air filter changes most frequently if you’re working in an industrial environment. 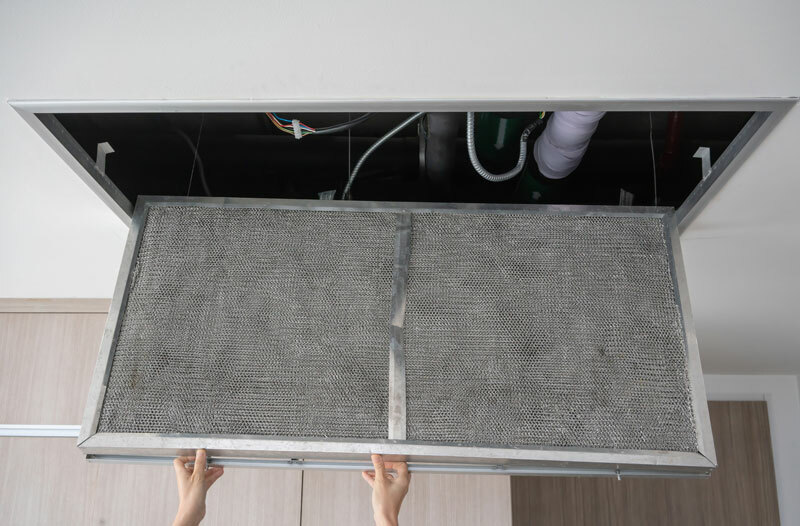 This is also the type of space where you’ll need to pay the closest attention to proper air filter changing and maintenance. After all, you don’t want dangerous chemicals floating in the air, potentially exposing people in your space to serious health hazards. In general, a good rule of thumb is to change out or clean your air filter about once a week in an industrial space. Keep in mind that you may also need a stronger type of air filter than you would in other spaces. You want one that can handle things like soot, smoke, pollutants, and much more. Above all, it’s about keeping your employees safe from potentially dangerous–even life-threatening–exposure to toxins. If you work in the restaurant industry, it’s no secret that you need to follow serious regulations when it comes to sanitation. You always take the time to clean out your freezer and keep food prep stations spotless. But all that work could be essentially wasted if a dirty air filter is spreading dirt and dust around the restaurant and kitchen. In general, you should clean out or change your restaurant’s air filter about every four to six weeks. We strongly suggest inspecting the filter for signs of serious debris at the end of every week for best results. Remember that the type of filter you have will also influence how often it needs to be changed. When in doubt, ask a professional. You should also ask them about other ventilation options you might have when it comes to preparing food in a commercial kitchen. Perhaps you’re the owner of a smaller boutique shop. In this case, the general rule of thumb is that you change out your commercial air filters about once every twelve weeks, at a minimum. Again, this will depend on the kinds of things you sell–and the clientele you cater to! For example, if you’re a business that sells pet supplies, baked goods, or even perfumes and other scented products, you may find that you need to switch out your filter about once a month to keep things smelling fresh. You don’t want to deal with the discomfort of breathing in pet dander. You also don’t want to turn off your customers because your store smells stale and musty. Remember that if you begin to experience itchy and watery eyes, a clogged and dirty air filter may be to blame. Remember that the answer often varies depending on what you’re doing within a commercial space. It’s also influenced by the type of filter you have. Looking to invest in the ideal commercial air filter for your business? We can certainly help you with that. Make sure that you browse through our extensive inventory of air filters to find the right choice for your commercial space. Always feel free to reach out to us if you have any questions while shopping. You can breathe easier, even while at work. Let us help you make it happen.